The Staffordshire Hoard was found in 2009 by a metal detectorist just to the south of Watling Street in the parish of Hammerwich in southern Staffordshire. The find was a national and international sensation. After extensive survey and excavation the total haul now consists of some 4000 gold and silver objects. Dating remains a problem, but a consensus is emerging that deposition took place in the mid to late seventh century. There is no doubt that the hoard will revolutionize the study of certain aspects of the material culture of the early Anglo-Saxon period. In itself, however, if it delighted historians and archaeologists alike, it is did not surprise. The role of treasure in Anglo-Saxon society is well known: James Campbell memorably spoke about it at this conference in 1988. What is peculiar about this find is its composition: it is almost exclusively decoration that has been stripped from military equipment. Reference to the burial of such spoils of war are found in Beowulf. So it has been widely suspected that the original deposit was in some way ritual. That suspicion, however is apparently at odds with the site. The hoard was found on the side of a somewhat inconspicuous natural hillock in what had been before 1838 the extra-parochial township of Ogley Hay. The area is upland and before the nineteenth century there had been little to no settlement. In the middle ages it had been a royal hay and it has been suggested that early on it was used for transhumance by settlements to east and west. 'Out in the sticks' might have been invented for this site. It looks marginal in every way: in fact the perfect place to hide treasure. I think here of the famous scene in the film Fargo where the cash was stashed in a snow drift beside an anonymous road and marked with a small red ice scraper. Well, perhaps. Ultimately, we cannot reconstruct the mindset of the person or persons who buried the hoard. Today, however, I will make a case for seeing Ogley Hay as less marginal than liminal. Yes, remote it was, but it was a place of importance to the peoples of the area. For such a minor place, Ogley Hay is relatively well documented. It is first recoded in an Anglo-Saxon charter of 994 in which Archbishop Sigerid confirmed to the church of Wolverhampton the grant of the settlement by Wulfrun, along with eleven other places. The charter is a forgery, but its use by the Domesday commissioners suggests that it incorporates an essentially authentic pre-Conquest tradition. The accompanying OE boundary clauses are indubitably sound evidence for the Anglo-Saxon landscape of the area. It is the Domesday account, though, that first provides details of the fee, with the addition of four further parcels of land, as an estate. I don't have time to go through the technicalities - many of the tenurial relationships can only be recovered from an examination of the diplomatic of the text - so I'll just give the highlights. Ogley Hay was a member of the manor of Wolverhampton, along with lands in Upper Arley, an unidentified Eswic, Trescott, Bilbrook, part of Tettenhall, part of Willenhall, Wednesfield, part of Bushbury, and Hilton by Wall. Although the fact is not explicit, the forms of the text suggest that the whole complex was a soke. By contrast, the remaining lands in the Wolverhampton fee were constituted as separate manors (figure 1). Now, if we follow the usual dictates of landscape history, we would reconstruct an earlier estate by looking at the extent of the parish of the main church associated with it. In Wolverhampton we get a consolidated block of land (figure 2). Reconstructing the parochiae of other churches in the vicinity we end up with a discrete and well-defined estate. However, I’m uneasy with this reconstruction. I’ll put on one side for the present the evidence behind it. It is based on a variety of pensions and the like of various dates and uncertain significance. What is worrying is that Wolverhampton was one of seven royal free chapel in Staffordshire and nearby, namely Tettenhall, Penkridge, Gnosall, Stafford, Tamworth, and Quatford. This unique concentration suggests to me the possibility of a concerted system and a recent one at that. Neither archaeological nor historical evidence, such as it is, suggests that any of them predates the tenth century. I rather suspect that it indicates a royal initiative to bring the numerous freemen of the shire firmly within the control of the crown after the conquest of the area by Mercia and Wessex in the tenth century. Re-foundation of earlier minster churches is not precluded, but the point here is that the ecclesiastical structures we see in the eleventh century and afterwards are an uncertain guide to the organization of territory before the Conquest. The interrelation of the estate with surrounding fees provides a better insight. We are used to the idea of estate formation in terms of the grant of compact parcels of land by charter or book. Booking, though, was not the only means by which the fees we see in Domesday Book came into being. The division of large complexes, so-called multiple estates, element by element is less prominent in the sources, probably largely because it created loanland rather than bookland. It is, nevertheless, an equally significant mechanism of estate formation. It can be widely detected in recurring patterns of lordship in which two or more lords each had a share in a series of divided or closely related vills. Such interlocking patterns provide invaluable clues to the history of the tenurial landscape before it is explicitly documented. In the fenlands of eastern England they have led to the identification of complexes that can be dated to the Middle Saxon period. Similar patterns are found around Wolverhampton and it is these that point to the earlier context of the Domesday manor and its soke. The story is a complex one. Wolverhampton itself, along with Wednesfield, part of Willenhall, and possibly part of Bushbury formed a consolidated core. The remaining lands were detached. Arley, to the south-west, is remote from the estate structures around Wolverhampton and may be a stray addition to the fee. In 963 it was granted by King Edgar to his faithful minister Wulfgeat of Duddeston, in all likelihood a kinsman of Wulfrun. Eswic, probably somewhere in Kingswinford parish, may have had a similar origin. Neither exhibits suggestive interactions with surrounding estates. The other elements of the soke, however, are closely related to neighbouring fees. 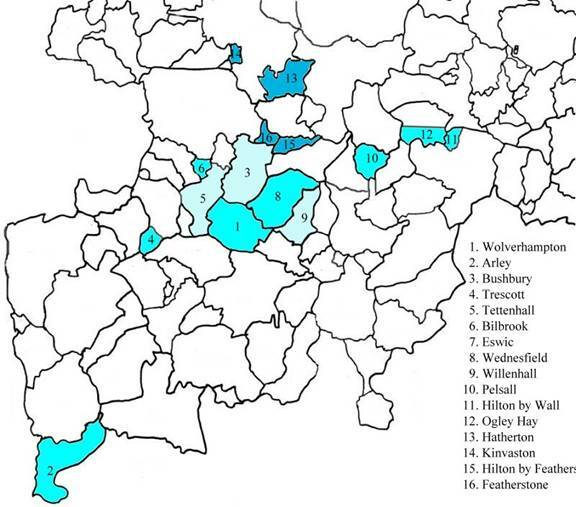 Pelsall, Ogley Hay, and Hilton by Wall are associated with the lands of Wednesbury to the east (figure 3, red). The manor of Wednesbury with its appendages was a royal manor in 1086 and apparently so in 1066. Of its members only Bloxwich and Shelfield, representing Walsall Wood, to east and west of Pelshall, are explicitly named, but others can be identified from later records. Walsall itself was the site of the church of the manor in the thirteenth century and the whole of the vill was held of the king and so it is likely to have been parcel of Wednesbury in 1086. Bentley was subsequently a royal sergeancy and so was probably also a member of the manor at the same time, while the tenurially related Darlaston may have had a similar status. None of these is named in the GDB text and so it is likely that they were either subsumed in the three hides assigned to Wednesbury itself or were geld free and therefore not described. It is clear that the manor had also extended beyond the lands of the king before 1086. Aldridge, held by Robert d'Oilly of William fitzAnsculf at the time of Domesday was in the soke of the king and had been held by two thegns in 1066. Robert succeeded to many ministerial tenements after the Conquest and its seems likely that he did so here. He also held Aldridge’s chapelry of Great Barr, again of William fitzAsculf, and Shenstone of Roger of Montgomery. There is no indication of his office, but it was apparently real enough. By the 13th century all three settlements were in his honour of Hook Norton as was the manor of Wednesbury itself. Pelsall, Ogley Hay, and Hilton interlock with this complex. Wolverhampton's land in Willenhall (figure 3, tan) is close to Wednesbury and could conceivably have been part of the manor sometime before the Conquest. The king's land in the same place, however, was constituted as a second royal manor in 1086. As far as can be perceived, the manor had no other members at the time, unless the thegnages in Bentley and Darlaston belonged to it, but in the later Middle Ages it was represented by the manor of Stow Heath which extended into Wolverhampton and Bilston. Again, there is a degree of interlocking with the Wolverhampton fee. Bilston itself is described in Domesday as a separate tenement. 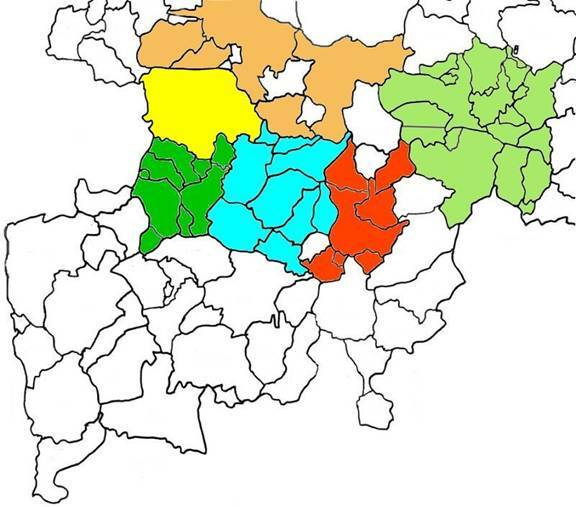 It was also in the hands of the king, but it was held as a member of the king’s manor of Tettenhall (figure 3, dark green) rather than of Willenhall or Wednesbury. It is this manor that provides a context for Wolverhampton’s lands to the west. Bescot to the east of Wednesbury in the parish of Walsall belonged to the manor, as did Compton, Wighwick, Codsall and Perton in the parish of Tettenhall. Trescott can be said to be only geographically related to this complex, but Tettenhall and Billbrook would seem to have been cut out of the larger estate. The tenements in Bushbury, Featherstone, and Hilton by Featherstone are not unequivocally related to any of these three royal manors. Much of Bushbury was in the hands of William fitzAnsculf. But there were various other interests, notably land that belonged to what was probably a comital estate in Essington to the north. Whatever its status, it was not the most substantial estate in the area. That was the bishop of Chester's manor of Brewood which abutted on Bushbury and Featherstone to the west. 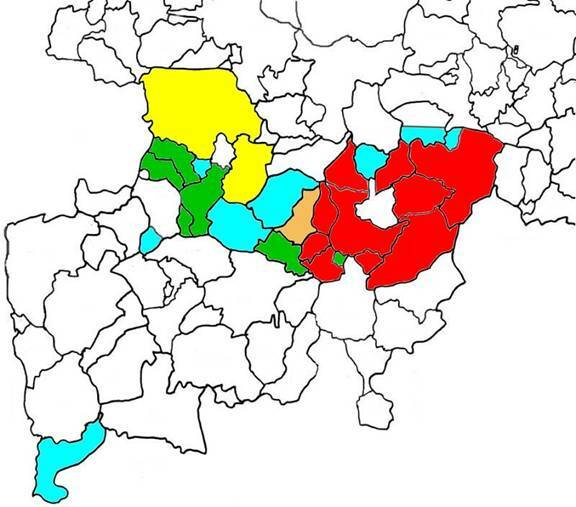 There is nothing to suggest a tenurial link in either 1086 or 1066 with either the Wolverhampton or Essington estates, but the place-name Bushbury, 'the bishop's settlement', strongly suggests a connection at an earlier date (figure 3, yellow). The manor of Wolverhampton, then, was associated with four distinct tenurial complexes in 1086, namely the three royal manors of Wednesbury, Willenhall, and Tettenhall, and the manor of Brewood. This might seem to suggest that the complex had no identity earlier than the foundation of the church of Wolverhampton in the late tenth century. There are indications, however, that the three royal manors had always been closely associated. The identification of Bescot to the east of Wednesbuy as a member of Tettenhall is a straw in the wind here. It is an odd connection unless it represents an earlier structure. There are indeed other links. Bradley, for example, most likely a member of Wednesbury, was in the township of Wolverhampton in the middle ages. This is not necessarily an ancient feature but could, conceivably pre-date the hundred boundary that divides the two settlements. There are numerous other interconnections of this kind on both an administrative and ecclesiastical level. But it is the place-names Wednesbury and Wednesfield that provide the most compelling evidence. Wednesbury means 'Woden's defended enclosure' and Wednesfield 'Woden's open land'. The specific of both names, namely Woden', has excited much comment as a marker of pagan survivals. But it is the generics, bury and field, that interest us here. In estate terms they must indicate that Wednesbury was a fortified nucleus in an estate called Wednesfield. There is an elegant demonstration of the relationship in the earliest reference to Wednesfield. Writing in the late tenth century and drawing on texts no longer extant, Ealdorman Æthelweard recorded that in 910 the Danes were defeated by the combined armies of Wessex and Mercia at Vuodnesfelda. John of Worcester and the Annals of St Neots similarly identify the site of the battle as Wednesfield. The other versions of the Anglo-Saxon Chronicle, by contrast, call it Tettenhall. The disparity has provoked much discussion, with proponents of both sites providing reasons for the notice of the other. But the apparent contradiction is resolved if Wednesfield is understood as the estate name and Tettenhall a place within it. So, it can be tentatively concluded that that part of the Wolverhampton estate that approximated to a soke in 1086, including the site of the deposition of the Staffordshire Hoard, was granted out of a royal estate called Wednesfield. The lands associated with the three royal manors in 1086 define its minimum extent (figure 4, red). It would appear to have extended further south in the tenth century, for the bounds of Wolverhampton, as recorded in a charter of 984, included Upper Penn. The boundary to the north is more clearly defined. 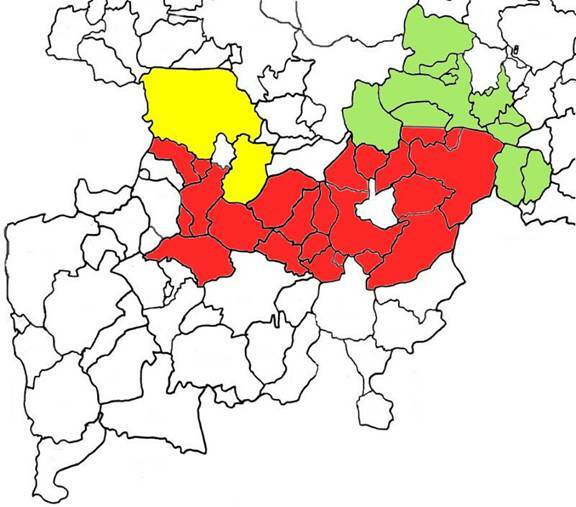 Bushbury, 'the bishop's defended enclosure', may well have been named in apposition to the king's enclosure in Wednesbury and so the Brewood complex would mark the limits of Wednesfield to the north west (figure 4, yellow). Further east Watling Street, recorded as the northern limit of Ogley Hay in the 994 charter, was the boundary between the king's land and that of the church of Lichfield (figure 4, light green), possibly with the place-name Norton in Norton Canes, 'the northern settlement', t the west of Ogley Hay, memorializing it. More certainly, Little Aston, 'the eastern settlement', in Shenstone parish marks the eastern boundary. The dating evidence, such as it is, does not go much beyond 910. But it is likely that even then there was already a long history of royal administration in the area. Thus, in 733 King Æthelbald of Mercia granted to Mildrith, the abbess of Minster-in-Thanet, and her familia the remission of the toll due on one ship at London, in loco qui dicitur Willanhalch. Willenhall was clearly a royal vill, or part of one, in the eighth century. Unfortunately, there is little early documentation for the Lichfield estates, but the reservation of ecclesiastical dues throughout the fee, both through extended parishes and the right to advowsons, is striking. The close match of secular with spiritual rights suggests that the complex was early, possibly even going back to the foundation of the church in the seventh century or before. Given the nature of the limited sources, inevitably much of this is best guess. Nevertheless, there is sufficient evidence to suggest that Ogley Hay had been granted out from the periphery of what had long been a royal estate. This in its turn raises the possibility that the Staffordshire Hoard was deposited in the king's land close to a major boundary. The fact in itself, of course, might be taken to underline just how marginal the site was. But it resonates with two further characteristics that point in a different direction. We have already noticed in passing that Ogley Hay was extra-parochial. It stood outside of the network of vills that made up the infrastructure of local government at its lowest level. Significantly, it was also intercommoned by communities to the east and across the boundary to the north. Such a profile is typical of sites that were used as communal meeting places. The farm was located just south of where the Shire Oak pub is now (figure 5). The site of the tree was down the hill to the west. 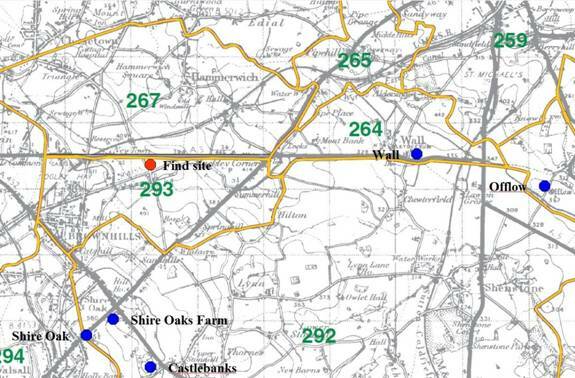 Neither Shire Oaks Farm nor Shire Oak was within the bounds of Ogley Hay as mapped in the nineteenth century. However, it is possible that one or both were at an earlier date. Unfortunately, apart from Watling Street, the waypoints of the OE charter bounds of 994 are too vague to trace on the ground today with any confidence. But a perambulation of 1300 reveals that Ogley Hay extended further to the west and south than later, although the exact line of the boundary cannot be determined. If it did not include Shire Oak and Shire Oaks Farm, then Ogley Hay abutted thereon. Either way, the association is of some considerable interest. Old English scir, as Shaw devised, connotes a division and the linking of the term with a specific tree must suggest that it was a meeting place. The earliest reference to Shire Oak dates from 1533, but neither then nor at any time in the Middle Ages did the county court meet there. Staffordshire, which came into existence sometime in the tenth century, always seems to have met in Stafford. The shire in question, then, was most likely an earlier Anglo-Saxon institution. 'Small shires' of this kind, encompassing areas as extensive as Wednesfield as reconstructed here and the lands of Lichfield, are well attested in the North and sporadically elsewhere in pre-Conquest England. I suspect, then, that Ogley Hay was less remote than it has always seemed. It may well have been economically marginal, but it seems to have occupied a prominent place in a mental landscape. And that mental landscape may have been of long standing when the hoard was deposited. Immediately to the south of the site of Shire Oaks Farm is Castlebanks, an Iron Age hill fort and, presumably an earlier communal focus. Two and a half miles to the east is Wall, the site of the Roman town Letocetum, while a mile further east was the meeting place of Offlow Hundred just north of Watling Street in Swinfen. Do we see here a sequence of successive folk assemblies? We may well do so. Now comes the difficult part. What does this tell us about the Staffordshire Hoard? Well, it is still possible that the site is completely contingent. It may just have been a convenient spot to hide a vulnerable stash. But our analysis makes this, the Fargo option, open to question. The tentative identification of the Ogley Hay area as a place of symbolic importance within a wider tenurial landscape provides a context for the ritual interpretation that its composition has suggested to many. The Beowulf scenario is a possibility. Others remain. For my part, I am agnostic and so, like the Staffordshire Hoard itself, I am going to sit on the fence.